Dive computers have become a mandatory part of diving equipment, and divers are active people who usually are into multi-sport actives and the dive industry is seeing this need and creating some new exciting products to ensure your safety and enjoyment of our sport. Also the diving community has a vast diverse demographic of divers that are needing dive computers to be more clear and easier to read. Divers are also wanting a computer to be as simple as their mobile devices and sync to their computers. This allowing them to share their dives on social media and log their dives more accurately. International Diving Centre sells three manufactures that offer the newest technology in dive computers that allow you to wear while diving as well as a wrist watch for other activities. Descent MK1 is also available in Titanium bezel and strap. What is lacking on this computer is air integration which allows you to monitor your air on your wrist. However this is a great choice for someone wanting to do more with a dive computer than diving. 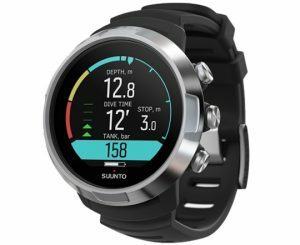 Suunto D5 is Suunto’s newest colour computer based on their hugely popular D4i Novo series dive computer, but with a huge upgrade with it’s colour LED screen, rechargeable battery and Bluetooth connectivity. 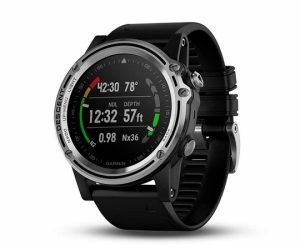 Suunto has been making dive computers and computer wrist watches for over 30 years and have a strong reputation as being incredibly reliable and accurate dive instruments. Their dive tables offer some of the safest models on the market, with the computer offering deep stop to assist the diver to make their dive the safest ascent to the surface. The Suunto D5 also works with the Tank POD air integration transmitter. Match With Your Style (Change the strap easily with the clever quick release system to fit your style. Choose a colour that matches your diving gear or pick your favourite colour silicone strap or leather to complete your casual style. Suunto D5 you can also change the straps easily and Suunto has about 12 different models of straps coming. 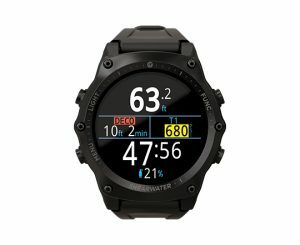 Shearwater Teric computer came out last May and caught us by total surprise with a waiting list for this product and demand that we have never experienced. Shearwater is a world’s leader in Colour LED display computers with the popular Perdix and Perdix AI. They took all the great feature these two computers and make it into a wrist watch version with AMOLED display as compared to LED the colours pop more and the blacks are not lit. This gives you a stronger display and uses less power. Shearwater offers great customer support and the units are made in Canada and the quality is the best we have seen. It coms with a slightly higher price tag than the other two models, however the AMOLED display does make a big difference. Shearwater has also developed a strong app which the computer can easily connect to and download updates needed or your dives to a log. 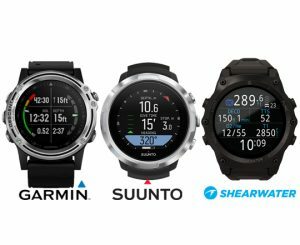 The Shearwater Teric offers some great features like. The Shearwater as all of these computers offer a free-diving mode, gauge mode and nitrox. The Teric is also a full open circuit multi gas, trimix decompression computer and offers air integration.